You'll be £4.99 closer to your next £10.00 credit when you purchase 3rd Air Division, 8th Air Force USAF 1942-45. What's this? The 3rd Air Division: Elveden Hall was the Headquarters of this division of the 8th US Army Air Force. 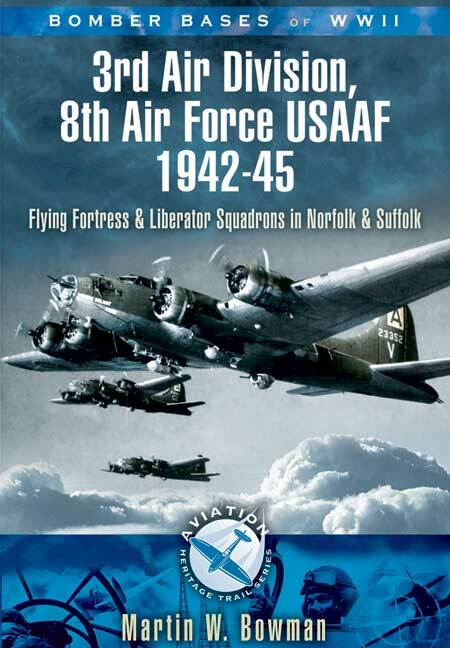 Broadly speaking it flew B17 Flying Fortresses out of Suffolk, but included some bases in Norfolk. Some units had short periods flying B24 Liberators. The famous 'Bloody Hundredth', based at Thorpe Abbotts was typical of the units within the 3rd Air Division. From June 1943 to January 1944 it concentrated its efforts against airfields, submarine facilities and aircraft industries in France and Germany. January through May 1944, the Group bombed enemy airfields, industries, marshalling yards, V-1 missile sites, including participation in the Allied campaign against enemy aircraft factories during Big Week, February 20-25, 1944. Participated in the first daylight raid against Berlin (March 4, 1944) and completed a series of attacks against Berlin March 6, 8, 1944 for which the 100th Bomb Group was awarded a second Presidential Unit Citation. In the summer of 1944 oil installations became the major target. In October through December 1944, the Century Bombers attacked transportation, oil refineries and ground defences in the drive against the Siegfried Line. They were involved in the December 24, 1944 mission to attack communication centers and airfields in the Ardennes sector during the Battle of the Bulge. January to April 1945, the Group concentrated on marshalling yards, bridges, factories, docks, oil refineries and ground support. Airfields included are Bury St Edmunds, Debach, Deopham Green Eye, Framlington, Great Ashfield, Horham, Knettishall, Lavenham, Mendlesham, Rattlesden, Snetterton Heath, Sudbury and Thorpe Abbot, which has one of the finest aviation museums in England.This book looks at the history and personalities associated with each base, what remains today and explores the favourite local wartime haunts where aircrew and ground crew would have sought well-deserved entertainment and relaxation. Other museums and places that are relevant will also be described and general directions on how to get them included.